We find much of the Norwegian light house history in the outer Oslo fjord basin. We also find examples of various types of lighthouses, from the coastal lighthouses Færder, Torbjørnskjær and Svenner to inlet lighthouses like Struten, Strømtangen, Homlungen and Fulehuk. And last, but not least, the very special Hollenderbåen lighthouse standing on Hollenderbåene in the middle of the fjord. There have been 212 lighthouses altogether along the Norwegian coast. Today there are 107 left, and 15 of them are located in the Oslo fjord (based on the fact that we include the Larvik coast as part of the Oslo fjord). They stand as solid testimonials of a time when almost all transport went by sea. The lighthouses have of course maintained their position as luminous guides for traffic in dangerous waters, especially in the dark. Today, when all lighthouses in the country are automated and de-populated, one shouldn't wonder that many regard the lighthouses in the Oslo fjord as enticing vacation paradises. Most of the lighthouses are located where the wheather conditions are extremely harsh, but in the summertime the Oslo fjord represents the Norwegian summer at its best with sunny rocks and sparkling ocean. It is possible to stay in 7 of the lighthouses in the Oslo fjord basin (Svenner, Stavernsodden, Strømtangen, Homlungen, Struten, Fyrsteilene and Fulehuk). Færder and Tvistein lighthouses will probably become parts of the coastal path and thus so-called accomodational lighthouses in the near future. How about spending a few days at a lighthouse during your summer vacation? It's an easy and salty adventure accompanied by the natural sounds of the ocean and the nature, and time and tranquility to relax. The lighthouses are located along the Norwegian coast like pearls on a string. Many of them are empty, but others are made usable by eager coastal associations and stand ready to welcome summer visitors. There is admittedly no hotel quality awaiting those who wish to stay in a lighthouse as the coastal associations base their activity on Den Norske Turistforening's (The Norwegian Trekking Association) idea of basic cabins and self-cooked food. Members of the associations serve as hosts on a voluntary basis, and ensure that adventurous visitors receive information and assistance. This makes your stay in the lighthouse a reasonable vacation deal. Besides great scenery and nice experiences, you can expect clean rooms, nice beds and the possibility of preparing your own food. This somewhat primitive kind of vacation contributes to make the stay especially attractive to modern people who otherwise and constantly have all the appliances of the modern world at their fingertips. If you add the location in the archipelago, it is actually quite strange that not even more people stand in line to secure a few days at such a special resort as a lighthouse. However, perhaps that is what is just about to happen - that people are beginning to discover this wonderful holiday opportunity. The lighthouses that are not yet part of the coastal path can still be excellent places to visit. The exceptions are that there isn't a bed indoors at your disposal and you can not use the buildings there. On the other hand, a stunning nature and coastal culture is there for you to enjoy, and it certainly is charming enough to spend the night outside the lighthouse buildings in a cool summer night enjoying the lovely sea air and some quiet sounds from the ocean slapping against the reefs. The Homlungen Lighthouse from 1867 is situated in the outer Oslo fjord, and there are only a few small islands between the lighthouse and Sweden. The Swedish mainland can be seen in the east and the islands Kosteröarna in the south. Otherwise, Homlungen is encircled by the ocean and the flat Hvaler islands. The lighthouse and the place is unique with their location near Skjærhalden in Hvaler. Homlungen Lighthouse was first lit on October 1, 1867. The lighthouse was depopulated and automated in 1952. The lighthouse is located on the small island named Homlungen, which earlier was a cotter's farm under the Hvaler vicarage. Homlungen Lighthouse was built to guide ships entering the inner waters towards Singlefjord and Halden. Homlungen is the one of Norway's lighthouses located closest to the Swedish border. It is in very good condition thanks to the association "Friends of Homlungen" (Homlungens Venner). They have done a remarkable job of yearly maintenance of the lighthouse. It consists of a wooden building with a tower, outbuildings, a boathouse and a landing. The lighthouse has not been altered much since the reconstruction in 1915. Its interior has also been largely preserved from this time. The lighthouse is equipped with a french 4th order lens apparatus, and parts of the original string cover is still intact. The light's height is 13.5 meters above high tide with an arch of 12 nautical miles. 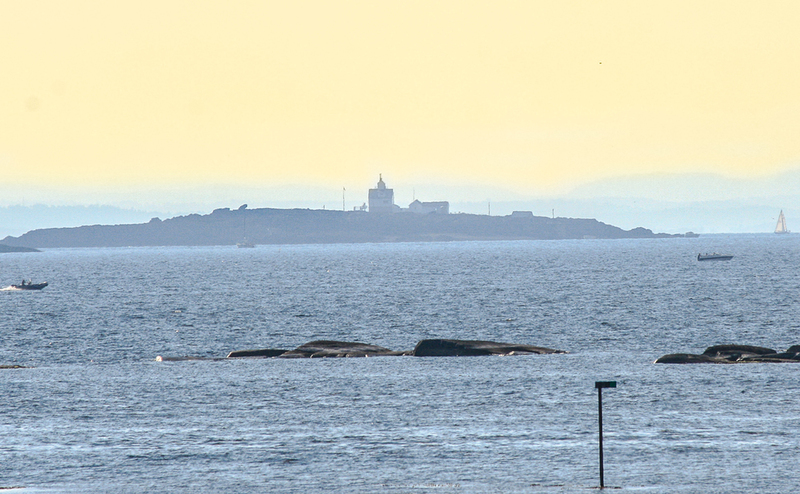 The Oslofjorden Friluftsråd (The Oslo Fjord Outdoor Council) has a strong position in the Hvaler archipelago municipality, and wanted to acquire the lighthouse for many years. During the celebration of the council's 75th anniversary the lighthouse was given to the council as a grand gift by the Norwegian Coastal Administration. Today the Homlungen Lighthouse is operated as a rental house. If you want to stay for one or more nights in the lighthouse, please contact the Oslofjorden friluftsråd. Because lighthouses are of vital importance for sea traffic along the coast, the doors to the lights are locked - simply to prevent them from being vandalized or destroyed. Keepers' houses are being used for accomodation at most lighthouses with Homlungen Lighthouse on Hvaler and Haugjeta Lighthouse on Smøla as the only two exceptions. To spend the night in a lighthouse is just a curiosity after all, compared to the other buildings. The amazing nature is the same, regardless. Homlungen Lighthouse - only 15 minutes walk from Hvaler's "Capital"- Skjærhalden. The price for spending one night in the lighthouse varies from a couple of hundred Norwegian kroner per person per night to several thousand for rental of the entire lighthouse complex for one weekend. To rent the entire lighthouse it pays to split the rent between several people. There are usually several beds in lighthouses. The rates at Homlungen Lighthouse with its 12 beds (8 in the keeper's house and 4 in the outbuilding), are: NOK 2,290 a day for the entire complex, NOK 1,890 for just the lighthouse and NOK 900 for the newly restored outbuilding. A discount is granted for members of the Oslofjorden Friluftsråd. The lighthouse is not connected to the mainland and the only access is by boat. If you travel to Hvaler by car it may be parked at Skjærhalden for a fee. Bus connections to Skjærhalden are good, both from Frerikstad and Oslo. There is a blue-marked footpath from Skjærhalden over the rocks to the lighthouse. It is a 15-minute walk in rough terrain.The path is a little steep in some places, and can be slippery in wet weather. Two rowing boats marked "Kystleden" are placed on the shore and are used for transportation across the strait. Mooring for the boats is reserved at the lighthouse. Remember that the boats must be returned to the landside at end of stay, so that the next guest can get to the lighthouse! The test of time and decay has really prevailed at Torbjørnskjær Lighthouse. The high degree of wear caused by lack of maintenance over several decades is a sad sight. The future for Torbjørnskjær looks bleak, and the buildings are on its last legs unless the owner, the Norwegian government, takes action. A barren place in The Skagerrak forecourt. Torbjørnskjær Lighthouse seen from the south. Torbjørnskjær is farthest offshore of all land in Østfold county. Together with Færder Lighthouse it marks the inlet to the Oslo fjord basin. It also functions as a border lighthouse against Sweden. The lighthouse flashes red every 10 seconds. The light emits 25.7 meters above sea level and reaches 15 nautical miles out. The first navigation mark was placed on Torbjørnskjær in 1803, and a small log house was built there in 1838. With the navigation mark it towered 11 meters into the air. The lighthouse was built in 1872. The bulding has architectual value with its particularly fine and precise masonry. The granite used to build the lighthouse was carved by convicts from the Akershus Fortress. The Torbjørnskjær Lighthouse is standing on a small reef farthest south in the Oslo fjord. It is hard to imagine a more dramatic location for a lighthouse in the Oslo fjord basin. Only the horizon can be seen from any angle, and the sea is often foaming. The lighthouse is considered as one of the most unavailable along the Norwegian coast. Even in perfect weather, it is hardly possible to dock at Torbjørnskjær. It was therefore with good reason that the lighthouse keepers travelled to and from work by helicopter. Because the old landing ramp has not been maintained, helicopter remains the safest mode of transport to the reef. It is fascinating to think about the lighthouse keepers who lived out here with their wives and children in cramped conditions, and that they had to stay indoors much of the time due to bad weather. In one of the lighthouse keeper's diary entries from 1884, he writes: "The sea smashed a window in the lighthouse building. Found herring on the floor". Two families with a total of 11 children lived at Torbjørnskjær back in the day. A mini garden was tended to on a tiny piece of land, while the children ran about on the reef far out there in the outer fjord. The diesel generators were switched off in 1991 and the lighthouse keepers returned home for good. Since then the houses on Torbjørnskjær have stood empty, and the decay is evident. It is sad that an otherwise proud Norwegian lighthouse history must acknowledge the fact that this wonderful lighthouse is in such a poor condition. Today, a windmill powers the lamp, and when there is no wind, the diesel generators are remotely started from the mainland. The lighthouse flashes red every 10 seconds.The light emits 25.7 meters above sea level and reaches 15 nautical miles out. Unlike the Torbjørnskjær Lighthouse, as you aproach the Struten Lighthouse you will see that it is maintained and regularly serviced. The Struten lighthouse was built in 1907 and is located west of the island Nordre Søster. The lighthouse was manned until 1985. The Struten Lighhouse outside the Fredrikstad and Hvaler coast. The Struten Lighthouse is now run by the Gamle Struten Foundation and is rented out to the public. Here are great conditions for swimming and diving. The first initiative to build a lighthouse at Struten was taken in 1886 by the Fredrikstad and Sarpsborg Seamen's Associations. The Director of Lighthouses agreed that Struten was a convenient location for a lighthouse, but thought that a realization was for the far future. In the autumn of 1904 the bark "Sir John Lawrence" went down close to Struten and the entire crew of 13 perished. The wreck was located in 1997 and is considered a marine archaeological find of great value. The accident led the seamen's associations to promote their claim again. The Struten Lighthouse was built in 1906-07. There are several known wrecks nearby. The "Albatross", a German torpedo boat/mine layer that went down in April 1940, lies near the Søsterøyene islands, close to Struten. The motorship "Thor" is located due west of Struten. The small island Struten is made up of sedimentary rock, a conglomerate of weathered materials from rhomb porfyry. Here is a rich bird life, and the large bird populations provide an abundant supply of fertilizers and nutrients. Therefore the barren soil has a growth basis for a varied flora.The beach is characterized by a richness of species unusual on our latitude. If you want to visit Struten, there is a pier on the north side that may be used in calm sea and southern wind. The pier is highly prone to swell and not suitable for accomodation. A buoy is placed on the north side of Struten. Smaller boats may dock at two piers in the bay on the south side. It is difficult to enter/exit the bay at high sea, but conditions are good at the inner pier, even in rough sea. The Old Struten Fyr Association is cooperating with Oslofjorden Friluftsråd and rental inquiries should be directed at OF after opening of booking on February 3 at 10:00am for OF members. Before this date bookings can be made directly with the Old Struten lighthouse, attn. Skjalg Sørensen, phone 99710293 or by e-mail: elseskjalg@gmail.com. Other rental related questions should be referred to Skjalg Sørensen, phone 99710293. The Strømtangen Lighthouse has guided the ship traffic to Fredrikstad for 151 years. On September 20, 1859 the lighthouse was lit for the very first time. The city has always been related to ship traffic, from the days of sail until the current motor boat enthusiasm. 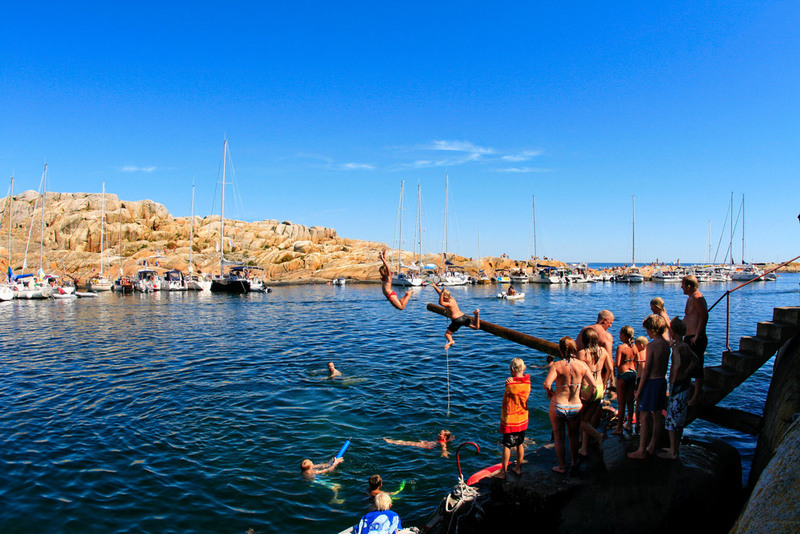 The unique archipelago outside the city limits is attractive for citizens and visiting boaters alike. But sailing in the archipelago is certainly no joke when harsh weather hit the outer Oslo fjord. The crew on both small boats and large ships have had that experience when they have approached Glomma's outlet in rough sea when darkness and fog have hindered the orientation abibility. The flashes from the lighthouses have therefore saved many lives. The houses on Strømtangen were built in 1886, and the lighthouse keeper and his family took over the lighthouse. The Strømtangen Lighthouse continued as a family station until it was automated in 1977. Decay took over after the lighthouse was abandoned. A bunch of merry friends formed the association "Onsø-beviset" in May, 1992. Their purpose was "to work to maintain coastal culture". The associoation launched a remarkable rescue operation for Strømtangen, an operation that lasted throughout the 90's. 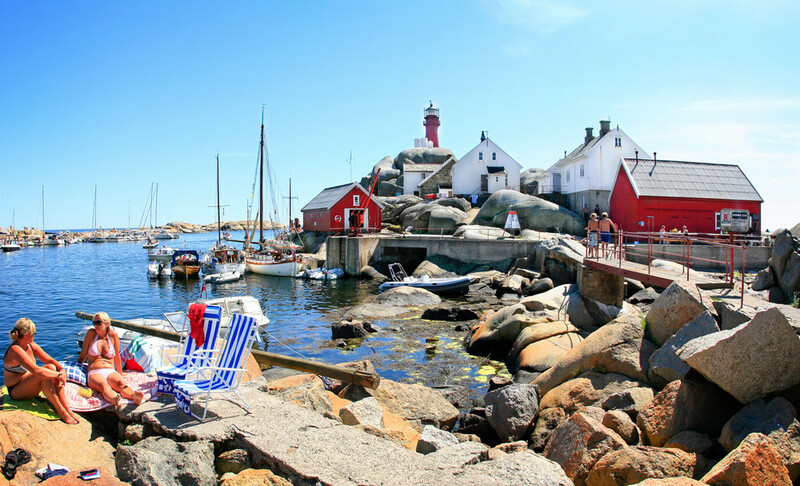 Today the lighthouse is a favorite vacation spot and a highly sought after rental property for vacationers, and also a focal point for friends of coastal culture in Fredrikstad. The Strømtangen Lighthouse marks the entrance to the western inlet to Fredrikstad, and the lighthouse is located on a tiny island as Onsøylandet’s outpost. It is actually only 10-15 swim strokes from the beach to the lighthouse. Only the narrow strait Strømmen separates the island Strømtangen from the mainland. The island has a great recreation area. It is well adapted for boating here with tables and grills and you can make an exciting excursion to the lighthouse. The view of the Oslo fjord, the Skagerrak and the Hvaler archipelago is beautiful. The island is also great for swimming and sunbathing on gorgeous rocks. Færder lighthouse, the very guide and landmark in the outer Oslo fjord. The lighthouse was established on Tristeiene in 1857 and is one of our biggest and most famous lighthouses, although it is located on a small islet. There is traffic around the lighthouse throughout the year, and Færder marks the very extremity or beginning of the country. Although most people knows the summer lighthouse at Færder, the waters can be both dramatic and fascinating on a windy autumn day. Færder lighthouse's tower is 43 meters tall and the second tallest in Norway. The light beams from a height of 47 meters above sea level. The light shines 19 nautical miles outwards. Here are well maintained buildings. Legend has it that they waited for the first ten years with building a keepers' quarters to see how the sea behaved over the islets. Before the keeper's house was built, the lighthouse keeper lived on Store Færder, which is adjacent to the Tristein islets. Store Færder is mostly known for the old lighthouse, and its remains can still be seen there. In the spring of 1697 the light was lit for the first time, as the second oldest lighthouse in the country after the lighthouse at Lindesnes, which came into operation in 1655. Færder fyr. Færder is the Norwegian lighthouse with the longest continuous service. A bit outside of the approach to larviksfjord and out towards the open ocean Svenner Lighthouse lures boaters in. Svenner is considered among boaters as one of the best ports in norway. The location, coast community, and the natural environments are enough to cause thousands of boaters and swimmers to visit the beautiful Lighthouse annually. Svenner Lighthouse was conserved by Riksantikvaren in 1997. By the end of 2002, the lighthouse unmanned. Today the lighthouse is a cultural memorial of natural worth. Gokstad coast team and the coast team of Fredriksvern currently operate the lighthouse. The few last years it has become fairly popular to use the Svenner lighthouse as a cottage. At the lighthouse there are 6 bedrooms and 19 beds together and well-furnished kitchen. 200 kroner for a night stay in Svenner archipelago must be considered as a cheap and charming vacation stay out in the ocean. Do you not have your own boat to take out to Svenner lighthouse? Then you can take one of the liners from Stavern in July and August. Svenner is full of peculiarities and treasures. Besides the lighthouse that charms you with a wonderful environment and ancient culture, the archipelago Svenner is a very interesting landscape in several ways. Poor soil and harsh coastal climate provides Svenner a unique geological and botanical diversity. Svennerarkipelet unprotected and exposed islands are especially rich in form and surface with traces of scour stripes, fractures in the rocks, potholes etc. Svaberget has character both from the ice pressure, motion and gravity, and from sea forces. The flora is especially unique in Svenner. There are instances of species of hitherto not found elsewhere. It grows among other orchids next to wild blackcurrant bushes. The location of the seas allows a myriad of birds to use the archipelago as an airport. Large amounts of eiders, several colonies of herring gulls, svartbakk, and fish gulls nest on Svenner in May-June. Remember to take your swimwear with you to Svenner. The water is clear and salty and you can swim through the rocks and islets in small narrow sound. Compared with other lighthouses, this ocean and surrounding area by the buildings sheltered from the worst winds. On sunny days it is so clogged with boats here that you can almost walk safely from boat to boat to cross the strait. There are several lit white sand beaches here in the inner sheltered bays. The first lighthouse on Svenner, a square stone lighthouse, was built in 1874. In the fog they shot a cannon every 10 minutes. The gun is today the Norwegian Maritime Museum at Bygdøy. The current cast iron tower was erected in 1900 along with the buildings. The tower is 18.7 meters high, while the lighthouse reaches 40.3 feet above high tide. The summer weather in this part of the Skagerrak coast is generally fairly nice. The good weather may explain why the Norwegian Meteorological Institute has had the lighthouse as a vacation restort since the lighthouse was unmanned in 1984 until 2008. PLAY AND HAVE FUN IN REFERBISHED FACILITIES. Fun and games in a newly furnished living room. It isn’t a great summer vacation without friendly feuds around a board game. The living room and dining room (picture) in the house are recently referbished with enough place for everyone to get together. Thanks to thousands of hours of volunteer efforts from members of Fredriksvern’s coastal team, the Stavernsodden lighthouse has become the holiday gem it has been - for everyone! Constantly increasing number of lighthouses and Akerøya are opening for vacation experiences. Stavernsodden lighthouse opened for accommodation in 2010 for only 200 kroner per night, so that anyone can live the good holiday life with boating, swimming, sunbathing, fishing, catching crabs, playing in the meadows, and grilling until well into the summer nights. With an almost romantic aura of olden times, and coastal history in the walls, there is almost a childish pleasure of how cozy it is to sleep upstairs in the renovated attic rooms in light blue colors. After a long day and summer full of activities you can’t wait for a comfy bed to recharge for the next day. Here you’ll fall asleep to the murmur and soft waves from the sea and wake up to the sound of seagulls and, hopefully, on a sunny day. Having to wash the dishes outside in a beautiful setting is only a true pleasure! Stavernsodden lighthouse has a fully equipped kitchen you can wash dishes in, but it's hard to resist the temptation to be outdoors. The island Stavernsøya is a wonderful archipelago paradise with its beautiful swimming and hiking. The island has a rich biodiversity. Favorable climate, shell deposits, varied natural conditions, and major infrastructure development provide the basis for the rich biodiversity of the island. Several very rare red-listed flora species have been recorded here: bulbous meadow-grass, woodland sage, ballota nigra, golden oat grass, and mallow. And then of course you will find the familiar and common flowers and the archipelago: thrifts, sticky catchfly, and Cow Parsley. The island also has a fairly diverse bird and mammal fauna. Among Vestfold’s lighthouses there are, in addition to the Stavernsodden lighthouse, living and accommodations at the Fulehuk lighthouse outside Nøtterøy island and Svenner lighthouse outside of Larvik Coast. There is a planned coastal highway by the two lighthouses in Vestfold, Færder lighthouse outside Tjøme and the Tvistein lighthouse outside Brunlanes. That way you can soon travel from lighthouse resort to lighthouse resort of Vestfold’s lighthouses for a very low price. The lighthouse building was build in 1855, but the current building was erected in 1874. The National Fortification primarily owns the building. Stavernsodden lighthouse is run by the Fredriksvern coast team who took over the site in 2008, but the beacon is NCA's responsibility. The lighthouse was automated and unmanned in 1984 and the lighthouse was listed for protection in 1997. The light’s altitude is 43 meters and the range is fifteen nautical miles. Beautiful and protected, the old lighthouse sits by the port to Skagerrak. Little has the facaded on the Stavernsodden lighthouse changed since it was created in 1874 to show ship the way along the Larvik coast. Vaction in the open ocean. Take a chair with you to the outer area outside of the lighthouse. Here you can sit and enjoy the idea of living on Skagerrak. Although Stavern’s region is going to be one of the places in Norway with the most sun hours, sometimes you’ll come to some dark days with rain. What better than to relax on the sofa with good reading material and some candy while the storm whips at the windows of the solid lighthouse. The kitchen doesn’t have a dishwasher, but otherwise is furnished with everything one could need and was both warm and cold water, as well as an available shower. Electricity, heating, and lights are of course fitted. The electrical fittings are new and each room has fire extinguishers. Live life in your own tempo – enjoy yourself! Mental luxury; let your mind run free while your body and mind are in a calm pulse. Out on Stavernsodden lighthouse, you are far from the stress and bustle. Here it is just you, archipelago scenery, and cozy lighthouse building. Stavern’s Fort on Citadel island was the first military facility in Stavern and was built under Gyldenløve during the 1680s in order to protect Stavern’s port against the Swedes. Later, the fort expanded and eventually (in 1750) protected under Fredriksvern. The Kruttårnet tower is a landmark and hosts theater and cultural events each summer. The houses are rented out to artists via Norwegian Visual Artists Association. Across the bay outside Stavern city is the 360 acres of Stavern Island and shields against Skagerrak. The island Stavern (Stavernsøya) is a wonderful archipelago paradise with its beautiful swimming and hiking. Go for a walk in the beautiful and exciting terrain, enjoy the sound of the roar of waves from a deck chair or swim in the fresh sea - there are several bays and beaches to choose from. Stavern Island, Torkild Island, and Citadel Island were originally three separate islands off of Stavern, but a causeway connects Torkild Island with Stavern Island and Citadel Island has kind of grown together with Stavern Island via a series of reefs and wetlands foundations. Once you’ve come to Stavern Island, we recommend a walk out to Stavern Fort and Citadel Island. There is an idyllic path to the lighthouse from Stavernsøya. That there are at least 65 ballast plants on the three islands, Stavern Island, Torkild Island and Citadel Island, because the sailing ships in the 1600s and 1700s prepared and depleted the soils of Stavernsøya. Most ships sailed with lumber to overseas ports, but it was rare that they brought back loads. Sailing without load was hopeless because the great weight of the rig and sails made ailing ships dependent on cargo or ballast to be stable in the water. Therefore ballast was aboard ships when they were returning without carrying cargo. When the ships came back to Stavern, the ballast discharged - often right in the sea or on the island and the mainland by Fredriksvern yards. Festtning port in the north, for example, was base port for Peter Wessel Tordenskjoldsgate. A former burial place also existed on the island. It is situated on the plain to the north of Torkild Island and has the name "Kjærregårdsbukta” (Dearest Farm Bay). It is said that Tordenskjoldsgate is buried slain there. A large stone monument was erected on the site in 1980 for the 200th anniversary of his birth.